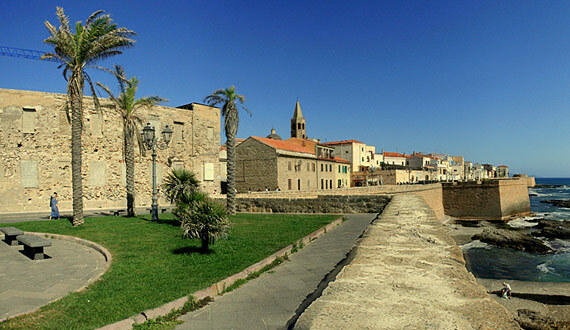 Alghero: Things To Do, excursion and trips in Sardinia. Many authors come here from the continent to look for inspiration, however every year the number of foreign tourists visiting Alghero is increasing, searching for holiday homes, relaxation and shopping due to low cost airlines like Ryan air with flights to Alghero. There is a lovely promenade next to the port and to the right, the fort of Maddalena. Places to visit include the multi-coloured dome of the S. Michele church and the Catalan gothic style S. Maria cathedral. Visiting in Spring you can listen to musicians at the April jazz, now in its seventh season. Many tourists visit for a weekend of shopping, where you can purchase Italian goods saving at least 100 euros in respect to London prices. For romantic couples it is also possible to have Civil or church weddings where newlyweds do not have to think about nothing as all is organised.